I am a new user to QGIS and GRASS. I want to use v.centerline so I opened GRASS as administrator on Windows 10 and I went to the gui of g.extension and successfully installed v.centerline. I opened QGIS, I still don't see v.centerline in the Processing Toolbox, is there anything else that needs to be done. Similar questions have been asked before but all of them refer to the GRASS manual and I don't understand that. I am certain that something more needs to be done, but can anyone clearly specify what these things are because GRASS website isn't helpful at all. welcome to the wonderful world of GRASS. The first thing I can think of that you have installed GRASS separately as v. 7.4.1 and installing the v.centerline there? Usually, QGIS 2.18 comes with GRASS 7.2 as built in with it, at least that is how it is installed in my system. You can check it by opening the GRASS shell (Marked as 1 in the first screenshot) inside QGIS and typing g.version in the console. If that is the case, you have to open the QGIS associated version from QGIS folder in your Start menu and install the extension there. 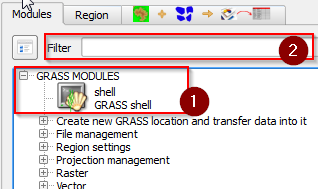 Anything available from GRASS in QGIS should appear if you search in the Filter box (marked as 2) or type the module name in the GRASS shell I mentioned. 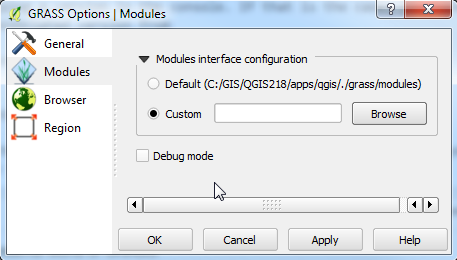 Also, note that the extensions in independent GRASS installation in Windows create an .exe file with the name of the extension and GRASS-QGIS uses GRASS modules as .qgm format from 'C:\your_path\QGIS218\apps\qgis\grass\modules'. In my opinion, you are really better-off using GRASS independently and bring the output of your analysis into QGIS for further processing. Not the answer you're looking for? Browse other questions tagged grass-7.0 qgis-grass-plugin or ask your own question. 'Add GRASS vector layer' button in QGIS 2.16.2 with GRASS 7.0.4?